Location: Baishan is a beautiful city located in the west of Changbai Mountain in southeast Jilin. It is neighbor to cities of Yanbian, Tonghua and Jilin. Yalujiang River separates it from North Korea in the south. History: As early as the Neolithic Age, human beings started to live in this area. It once belonged to different provinces including Fengtian, Tonghua, Liaoning in the early 20th century. In 1959, Jilin government set up Hunjiang City in this area, starting the history of its belonging to Jilin Province. In 1994, the city name of Hunjiang was changed into Baishan. Physical Features: Baishan is covered with mountains, hills and valleys with rivers winding across. Lava tableland is a special geographic feature of the land. Climatic Features: Baishan belongs to the temperate continental monsoon climate zone. It is the coldest city of Jilin with the annual average temperature of 4.6C (40.3F). In spring, the temperature difference between day time and night is quite high. Summer is very short and rainy while winter is long and dry. Autumn has the most pleasant weather with more cool and sunny days. When to Go: It's wonderful to visit Baishan in every season of a year. Each year in summer, autumn and winter, the city hold different tourism festivals such as Wild Flowers Festival in spring, Red Leaves Festival in autumn as well as Ice and Snow Festival in winter. 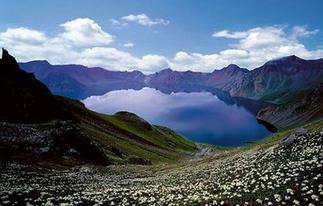 Local Highlights: Baishan is endowed with the famous mountain Changbai. Thick forests provide rich animal and plant resources. It is the hometown of 'Three Treasures in Northeast China' - ginseng, marten and deer antlers. It is also one of the three most important herb medicine production bases in China. Changbai Mountain itself is a charming tourist spot with breath-taking scenery such as the Heavenly Lake and Jinjiang Grand Canyon.